The gypsy moth caterpillar cut a wide-swath of destruction through some Great Lakes states this year. The caterpillar has been called one of the most destructive hardwood forest insect pests in the United States. The Great Lakes Radio Consortium’s Natalie Walston reports. Agriculture officials in Great Lakes states have tried a variety of chemical methods to stop the spread of the gypsy moth. Still, it’s estimated the gypsy moth caterpillar destroyed a record forty-two thousand acres of trees in Ohio alone this year. The Ohio Department of Agriculture says that number has doubled from last year. Agriculture officials in New York State say the gypsy moth caterpillar feasted on fifty thousand trees this year. That’s compared to twenty-seven thousand last year. But, the state of Michigan got a break. Michigan Department of Natural Resources entomologist, Frank Sapio says the insects died from a virus before they could destroy trees, and he says the DNR released a natural fungus that worked with the virus to kill the caterpillars. Last year, though, the caterpillars were blamed for eating ninety-seven thousand acres of tree leaves in Michigan. McCullough says researchers have had some limited success with injecting pesticides into infected trees. And scrubbing the trees with soapy water seems to work too. But she says such methods simply aren’t practical when you’re dealing with the millions of beech trees that inhabit the region’s forests. For the Great Lakes Radio Consortium, I’m Matt Shafer Powell. 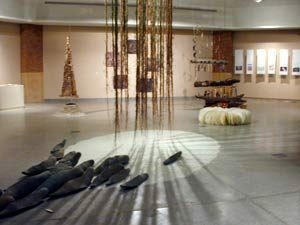 "Revisioning the Great Lakes" is an exhibit of student art created through field research at the University of Michigan. Photo by Tamar Charney. People who study the natural world often do field research. They go to learn about plants, animals, and the ecosystems we live in. But scientists aren’t the only ones who can make use of time spent studying the outdoors. The Great Lakes Radio Consortium’s Tamar Charney reports. A group of students from the University of Michigan have stopped spreading sand on the floor and hanging sticks from a gallery ceiling to watch a video…. The tape is of a trip they took…to sail, to camp, to hike, to learn about the aquatic life in the great lakes…. …And to do some field research. But these students aren’t scientists…. they’re artists. And they are in the process of putting together an art exhibit. Joe Trumpey is a professor of art at the University of Michigan. He also teaches scientific illustration. And for years he’s been taking those students to the dessert, and even the jungle, to learn in the real world — instead of the classroom — about flora and fauna and the cells and structures they draw. Now he’s bringing this same method to a studio art class – to encourage these students to develop a relationship with the ecosystems of the Great Lakes region. But they did more than just experience the land. Gerry Mull is a graduate student in Fine Arts and a member of the class. “We explored a lot of environmental issues around the Great Lakes, talked to sea grant people and people doing different kinds of about ecological problems with the Great Lakes. It was only after learning about fisheries, the food chain, the history of the Lake Michigan sand dunes, the economic impact of Great Lakes shipping, and the plants and animals here that the students got down to the business of creating art out of what they learned. Gerry Moll has hung long pieces of what looks like brown grass from the ceiling. 24 big primitive forms that resemble sturgeon hover over sand he’s spread out on the floor. He says he hopes his piece creates a longing in the people that see it for the huge number of these fish that used to swim in this region. What these students are doing falls loosely under the category of ecological art — there’s a number of branches of this field – There are artists who actually restore the environment – creating fish habitats or cleaning up a Brownfield as their art. Then there are artists like Gerry Mull who are trying to rekindle our concern for nature. The University of Michigan is in the process of developing an art curriculum that focuses on the environment. And the University of Michigan isn’t alone. Environmental issues are popping up in arts schools and art classes of all levels. Don Krug is a professor of art education at Ohio State University. Krug along with the Getty Museum has even developed on-line curriculum materials to help teachers get their students involved in creating art that draws on environmental and ecological issues. University of Michigan Art Professor Joe Trumpey says it only makes sense that art would be addressing something as fundamental as the health of our planet. And for artists to create meaningful art about the natural world, Joe Trumpey says they are going to have to immerse themselves like a scientist in the field. Studying the ecosystems around us through paint, clay, charcoal, and the other tools of the artist. For the Great Lakes Radio Consortium, I’m Tamar Charney. The study was released by the Canadian Institute of Environmental Law and Policy. It looked at Ontario’s pollution program for surface and groundwater over a five-year period. And it found the number of pollution discharges, spills and leaks doubled between 1994 and 99, while the number of investigations dropped. But ministry spokesman John Steele says things have changed over the last couple of years. Steele says the number of cleanup orders issued to industry increased by more than 300 percent in the last two years. But the study’s authors say the province releases little information about water pollution to the public. For the Great Lakes Radio Consortium, I’m Karen Kelly. period to talk, only one was willing to sit down with us. very much. So, we came here to find if that was true. part just want to be left alone. hundreds of farmers about how they make decisions. farmers tend to get defensive. thinks others have hidden agendas. pre-conceived notions and asking the important questions. have a whole lot of influence with farmers. More and more Americans have been taking recycling seriously over the last two decades. So much so that today, the EPA says about 30 percent of the trash Americans produce in their homes is recycled. And the recycling rate for most Great Lakes states is near that average. But while the agency expects that number to continue to rise, not everyone thinks more recycling is better for the environment. The Great Lakes Radio Consortium’s Mark Brodie takes a look at the economics of recycling. Albany’s recycling target is similar to that put out by the EPA… and is about the limit that one former EPA assistant administrator says is necessary. Doctor J. Winston Porter was instrumental in starting curbside recycling in the United States in the 1980’s…. but now he says people are taking a good thing too far. One of those states that’s right about at porter’s limit is Wisconsin. Greg Swanson of the state’s department of natural resources says Wisconsin recycles about 40 percent of its waste. He says the state’s laws call for beneficial re-use. That means the state does not want to spend more energy recycling something than it took to make it in the first place. Swanson says that makes decisions about what to recycle and what not to recycle a little easier. Swanson says that end result is crucial for recycling programs to survive. He says Wisconsin has budgeted more than 24 million dollars for recycling programs this year. That money goes to pay for trucks, drivers, and people who sort the recyclables, among other things. If a state or city recycles something, it has to be able to sell it. If the costs of recycling are higher than the profits from selling the materials, the city or state loses money on the deal. But not everybody believes more recycling hurts the economy. Will Ferrety is the executive director of the national recycling coalition. He says the more Americans recycle, the better it is for both the environment…. and the economy. Ferrety says states should try and recycle as much as possible. He says it’s preferable to many of the alternatives. Among Great Lakes states, Minnesota and New York have the highest recycling rates…at more than 40 percent each of their total waste. The EPA says other Great Lakes states recycle between 20 and 29 percent. Albany, New York’s Joe Gieblehaus says even though many officials on the state and local level would like to recycle more…. the green of the environment sometimes has to take a back seat to the green in the wallet. He says the market drives decisions about whether or not to recycle something. He says the city can only recycle materials that can then be sold to offset the cost of collecting them in the first place. Gieblehaus says his trucks collect about 13 thousand tons of recycled materials a year. He says that’s just enough to help keep the environment green…. without putting the city into the red. For the Great Lakes Radio Consortium, I’m Mark Brodie.